Oil recovery using carbon dioxide could lead to a North Sea oil bonanza worth £150 billion ($ 240 billion) – but only if the current infrastructure is enhanced now, according to a new study published today by a world-leading energy expert. A new calculation by Durham University of the net worth of the UK oil field shows that using carbon dioxide (CO2) to enhance the recovery from our existing North Sea oil fields could yield an extra three billion barrels of oil over the next 20 years. Three billion barrels of oil could power, heat and transport the UK for two years with every other form of energy switched off. Importantly, at a time of rising CO2 emissions, the enhanced oil recovery process is just about carbon neutral with as much carbon being put back in the ground as will be taken out. The technique could yield an enormous amount of oil revenue at a time of public service cuts and developing the infrastructure would put the UK in the driving seat for developing enhanced recovery off-shore oil production around the world. It would also allow the UK to develop its carbon storage techniques in line with the UK government's commitments on emissions reductions. The study, funded by DONG Energy (UK) Ltd. and Ikon Science Ltd., was presented, October 14th 2010, at a conference on Carbon Capture and Storage (CCS), at the Institution of Mechanical Engineers, London. The new figures are conservative estimates and extend a previous calculation that predicted a 2.7 billion barrel yield from selected fields in the North Sea. The UK Government's Energy Statement, published in April 2010, outlines the continued role that fossil fuels will have to play in the UK energy mix. 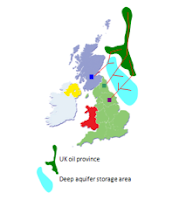 CO2 enhanced oil recovery in the UK would secure supplies for the next 20 years. Jon Gluyas, a Professor in CCS & Geo-Energy, Department of Earth Sciences, Durham University, who has calculated the new figures, said: "Time is running out to make best use of our precious remaining oil reserves because we're losing vital infrastructure as the oil fields decline and are abandoned. Once the infrastructure is removed, we will never go back and the opportunity will be wasted. "We need to act now to develop the capture and transportation infrastructure to take the CO2 to where it is needed. This would be a world-leading industry using new technology to deliver carbon dioxide to the North Sea oil fields. We must begin to do this as soon as possible before it becomes too expensive to do so. "My figures are at the low end of expectations but they show that developing this technology could lead to a huge rejuvenation of the North Sea. The industrial CO2 output from Aberdeen to Hull is all you need to deliver this enhanced oil recovery." Carbon dioxide is emitted into the atmosphere when fossil fuels are burnt and the UK Government plans to collect it from power stations in the UK. Capturing and storing carbon dioxide is seen as a way to prevent global warming and ocean acidification. Old oil and gas fields, such as those in the North Sea, are considered to be likely stores. Enhanced oil recovery using carbon dioxide (CO2 EOR) adds further value to the potential merits of CCS. Experience from the USA shows that an extra four to twelve per cent of the oil in place can be extracted using CO2-EOR. Professor Gluyas calculated the total oil in place in the UK fields and the potential UK gain in barrels and revenue from existing reserves using the American model. David Hanstock, a founding director of Progressive Energy and director of COOTS Ltd, which is developing an offshore CO2 transport and storage infrastructure in the North Sea, said: "The UK has significant storage capacity potential for captured carbon dioxide in North sea oil and gas fields. "There is a unique opportunity to develop a new offshore industry using our considerable experience in offshore engineering. This would give us a technical lead on injecting and monitoring CO2 that we could then export to the wider world to establish the UK as a world leader in carbon capture and storage technology." Professor Gluyas added: "Enhanced recovery of oil in the North Sea oil fields can secure our energy supplies for the next fifty years. The extra 3 billion barrels of oil that could be produced by enhanced CO2 recovery would make us self sufficient and would add around £60bn in revenue to the Treasury. "Priming the system now would mean we have 10-15 years to develop CO2 recycling and sufficient time to help us bridge to a future serviced by renewable energy."